We don’t often work in brass nowadays so these “golden” sheet metal fabrications easily caught my eye while walking around the workshop recently. They have been manufactured from CZ108 brass with a protective plastic peelable film to protect the surface in production. The finished display board front panels will also be polished and lacquered to protect the external polished surface from the elements often being used to display illuminated menu cards outside restaurants. We have manufactured these sheet metal brass panels by CNC punching the blank from sheet brass and then CNC bending the tray with formed safe edges around the sides. The corners will then be welded up to create a water tight joint and cleaned off smooth ready for the final polishing operation. I have a post from June showing one of the stainless steel display boards that we make. With a lot of the sheet metal products that we manufacture for our customers you never see them about until you start looking for them. There are 20-30 off of the brass diplay boards in this particular batch but we will manufacture from just special 1 off units upto 100’s off of standard sheet metal products. If you have a product that needs to be manufactured in brass please give us a call and we can see what we can do for you. Thanks for the positive feedback, we try our best to include as many different examples of sheet metal work and fabrications as possible on our website. nice post. Got a lot of informative ideas on sheet metal fabrication. I would surely expect more of your post. Thanks for the feedback. 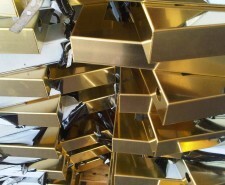 I will be posting plenty of examples of sheet metal fabrications in the future from our workshops in Fareham, Hampshire. Making sheets of out of extremely yielding metals is also a great deal in demand. For instance, steel, silver and copper can be made into really thin sheets that strength. These are identified as foils steel foils are sometimes used for recycling and develop new tools and item. 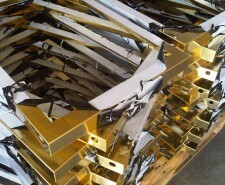 As well as brass we also manufacture sheet metal work from copper sheet and softer grades of alumninium.